Insta spam has never been sweeter. Get ready to whip out the hashtags #imahumangumball and #confettiinmypants and, most likely, #feelingslightlysickfromtoomuchsugar. 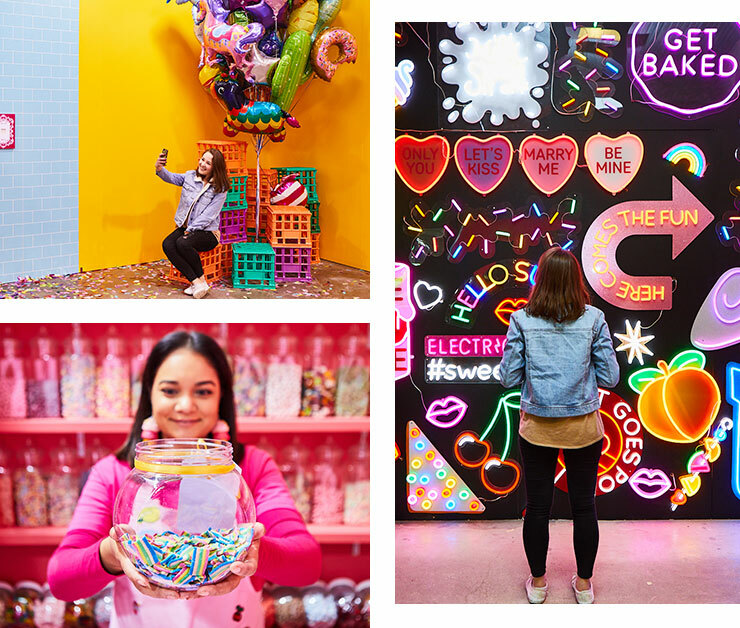 Sugar Republic is the latest, greatest interactive candy museum you never knew you needed in your life. If you’ve ever wanted to jump out a giant birthday cake, à la Singing in the Rain, this place is for you. It's kind of a giant homage to Australian sweets, ice-creams and desserts. Here's the deal: Apart from getting free sugary snacks throughout the exhibit (that alone could have convinced us TBH), you and your group of friends can make your way through 12 'sensory rooms'. It’s like real life Candy Crush, only infinitely less frustrating. There’s a doughnut igloo, a fairy floss swing, a soft-serve ice-cream machine and a sherbet-filled rainbow bridge. Not to even mention the adult-size pink ball pit (no more sneaking into the Chipmunks one) or the chance have a boogie in a human-sized gumball machine. No, really. You can’t make this stuff up. Make sure you snap a pic in front of Australia’s first ever neon art wall before all your mates do. Selfies are encouraged, thankfully, cause this is the best your 'Gram feed is going to look all year. Sugar Republic will be running in Melbourne on Smith Street till late August this year. You're gonna see this A LOT on your 'Gram, so get on down and see what all the fuss is about. Seriously, if you've been looking for a reason to book a weekend trip to Melbourne, this is it. Get tix over here. Did you hear sushi pizza is coming to Sydney? Yep.